A. 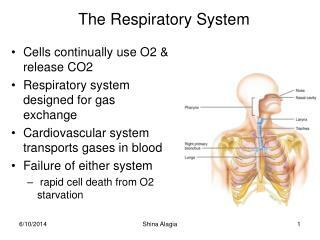 Function - provide oxygen to blood and remove CO2 from it. B. 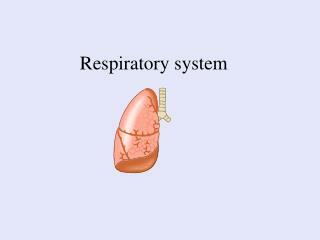 Three principle subdivisions of the respiratory system. 3. 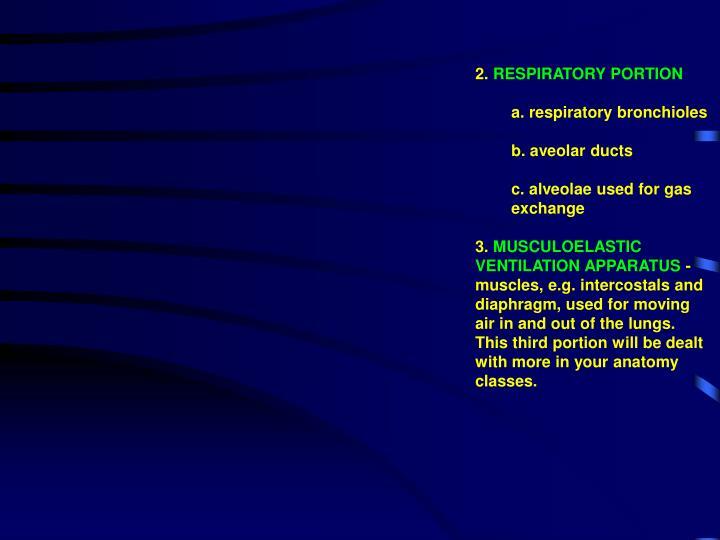 MUSCULOELASTIC VENTILATION APPARATUS - muscles, e.g. 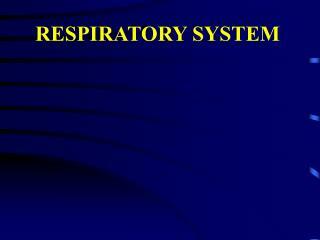 intercostals and diaphragm, used for moving air in and out of the lungs. 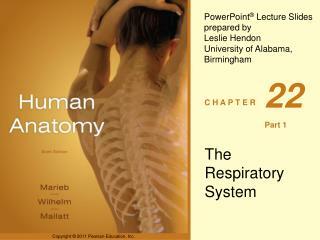 This third portion will be dealt with more in your anatomy classes. a. Elastic fibers - allow for expansion followed by passive contraction. a. 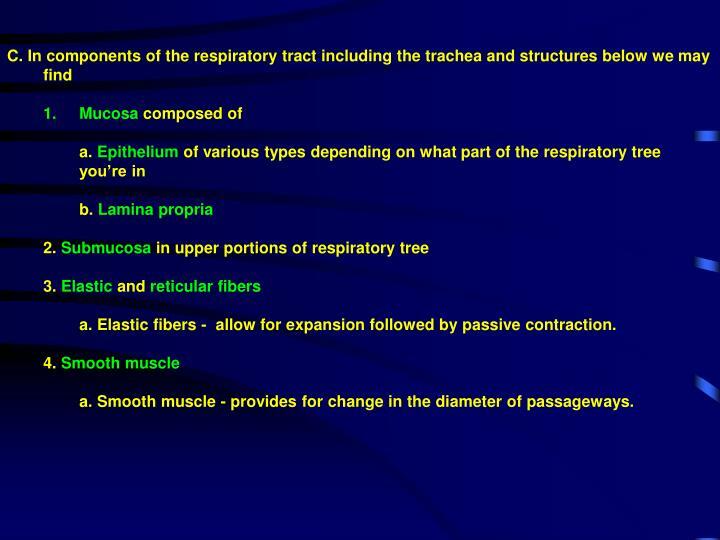 Smooth muscle - provides for change in the diameter of passageways. 6. 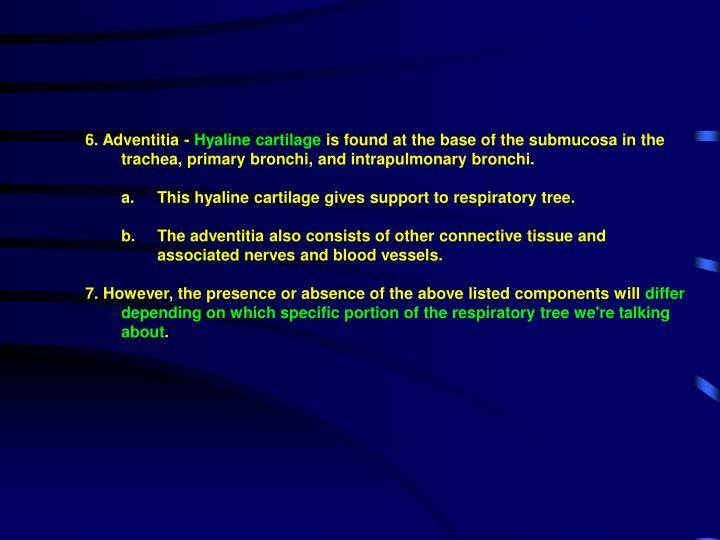 Adventitia - Hyaline cartilage is found at the base of the submucosa in the trachea, primary bronchi, and intrapulmonary bronchi. 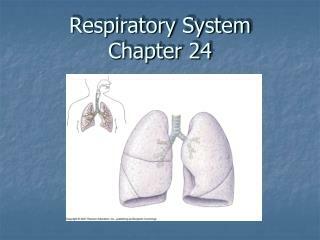 This hyaline cartilage gives support to respiratory tree. The adventitia also consists of other connective tissue and associated nerves and blood vessels. 7. 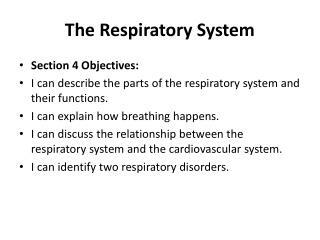 However, the presence or absence of the above listed components will differ depending on which specific portion of the respiratory tree we're talking about. We’ll discuss these, and others, later. b. Lamina propria contains many lymphocytes that are supported by a meshwork of elastic and reticular fibers. c. A band of elastic fibers called the membrana elastica interna separates the mucosa from the sub mucosa. 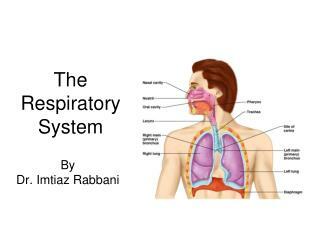 d. The submucosa is composed of loose connective tissue and contains the secretory components of serous and mucous glands whose ducts empty into the tracheal lumen. 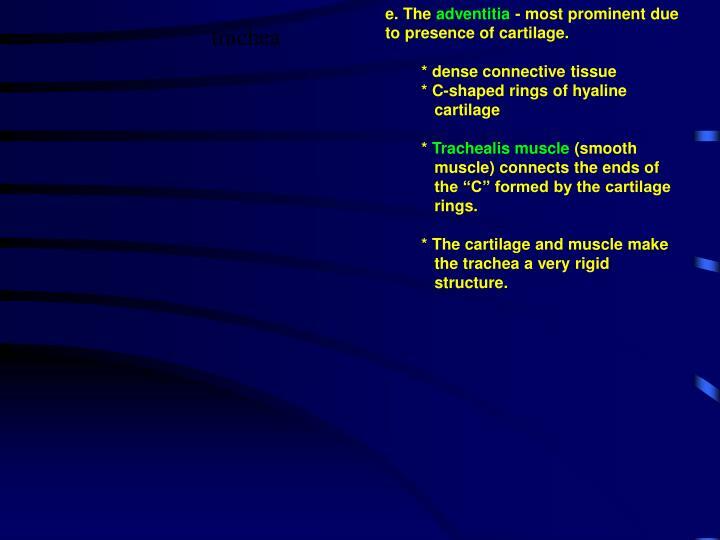 e. The adventitia - most prominent due to presence of cartilage. 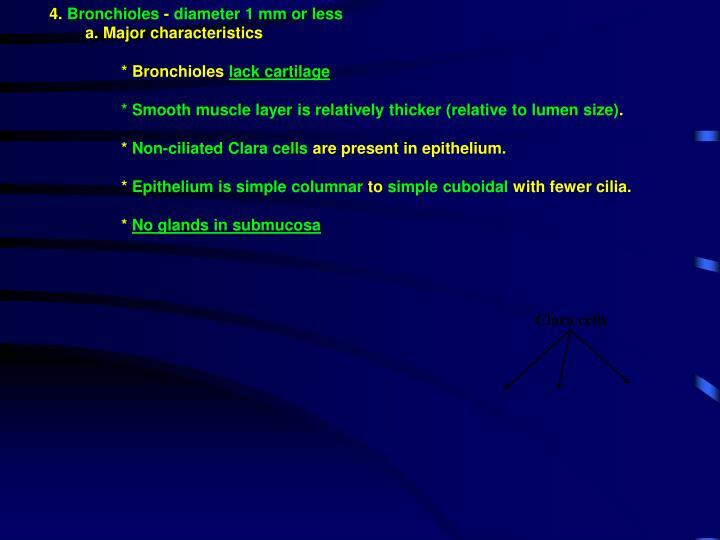 * Trachealis muscle (smooth muscle) connects the ends of the “C” formed by the cartilage rings. 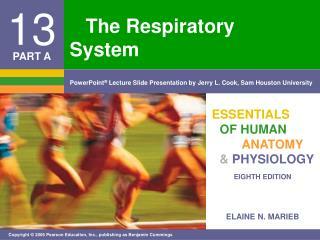 * The cartilage and muscle make the trachea a very rigid structure. a. 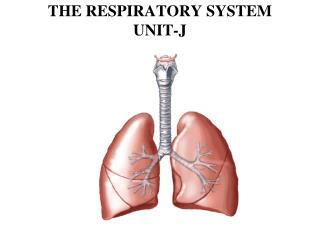 3 in right lung, 2 in left lung. 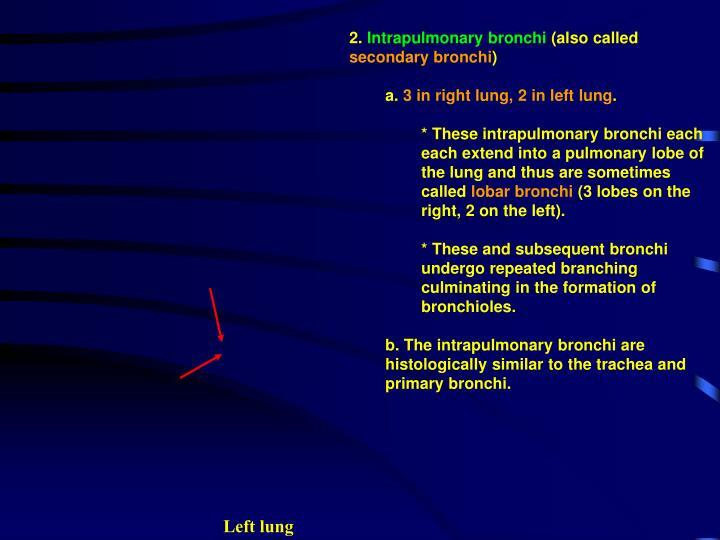 * These intrapulmonary bronchi each each extend into a pulmonary lobe of the lung and thus are sometimes called lobar bronchi (3 lobes on the right, 2 on the left). 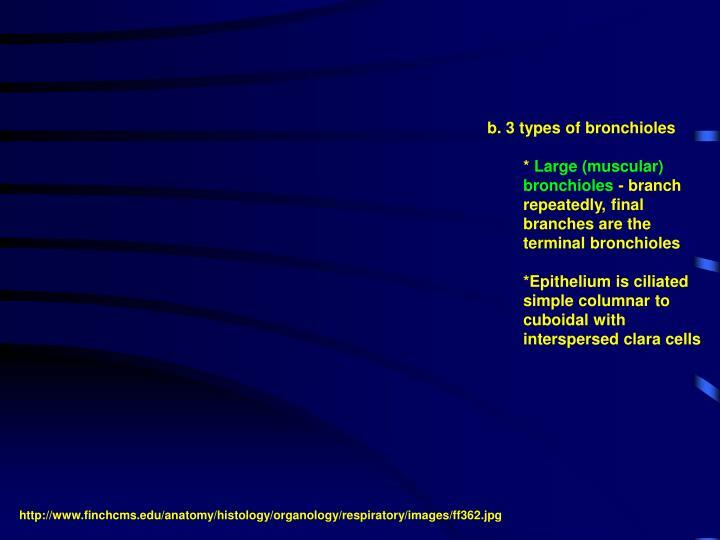 * These and subsequent bronchi undergo repeated branching culminating in the formation of bronchioles. b. 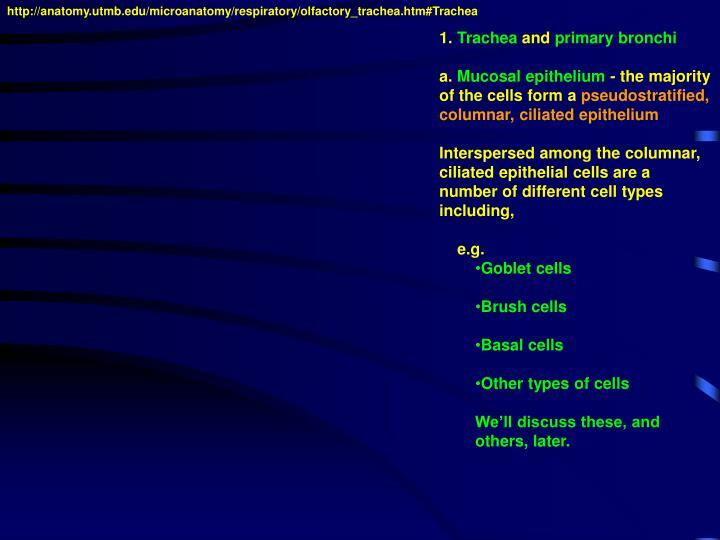 The intrapulmonary bronchi are histologically similar to the trachea and primary bronchi. 3. 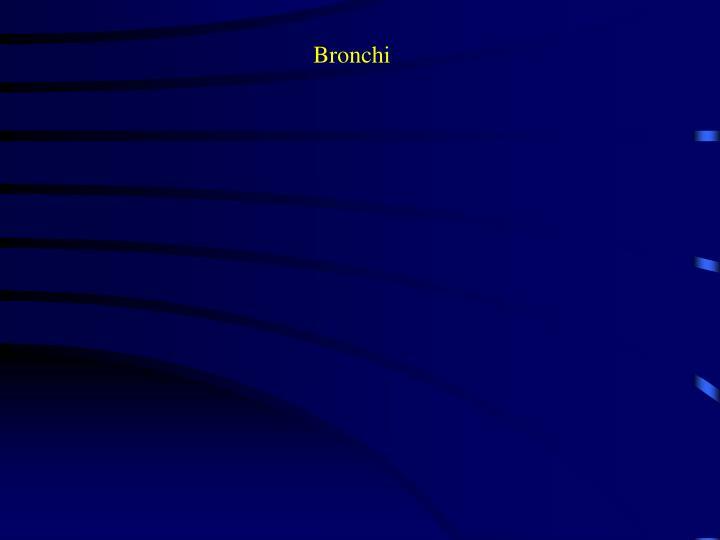 Tertiary and smaller bronchi. 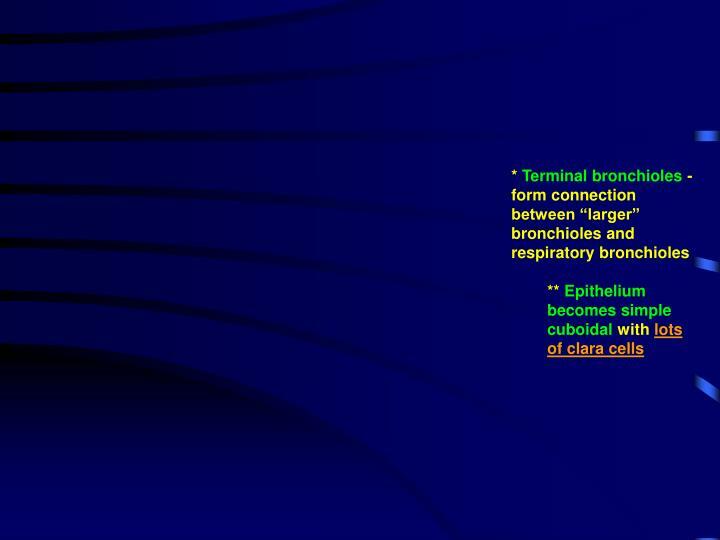 Differences in the histology develop as the bronchi become smaller. a. Cartilage rings are reduced to irregular plates of cartilage. b. A band of spirally wound smooth muscle present in lamina propria. Some texts may call this smooth muscle layer the mucularis mucosa (probably not a good name for it). c. Goblet cells in the epithelium become less numerous. d. Epithelium becomes reduced in height and simple columnar with less cilia. 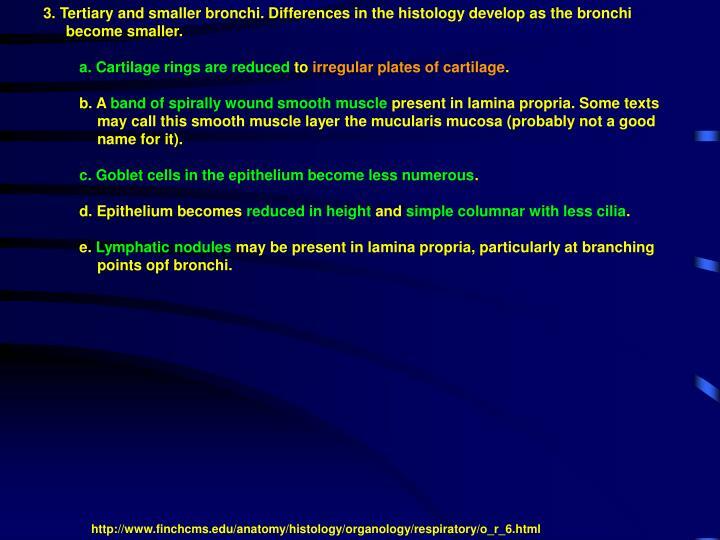 e. Lymphatic nodules may be present in lamina propria, particularly at branching points opf bronchi. * Smooth muscle layer is relatively thicker (relative to lumen size). * Non-ciliated Clara cells are present in epithelium. * Epithelium is simple columnar to simple cuboidal with fewer cilia. 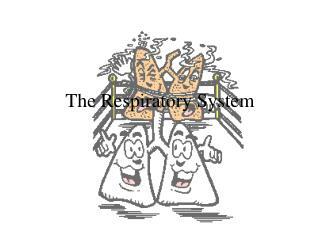 ** This is the transitional structure connecting the conducting zone to the respiratory zone. 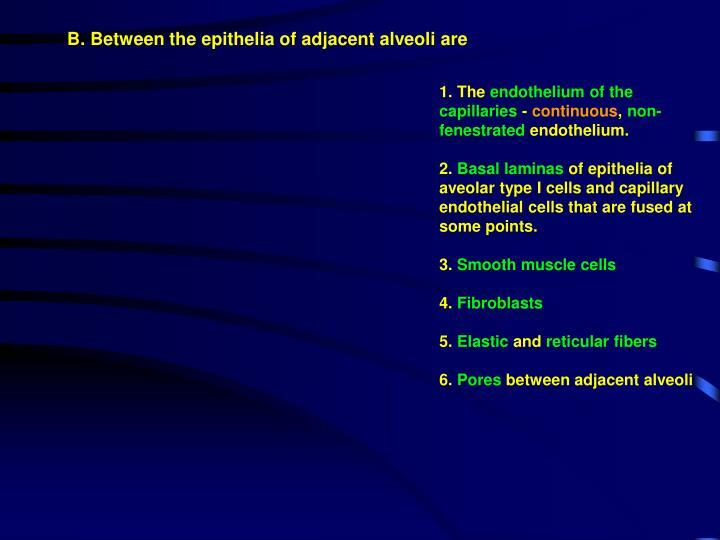 ** Alveoli open into this structure along its length with stretches of typical bronchiole epithelium in between. 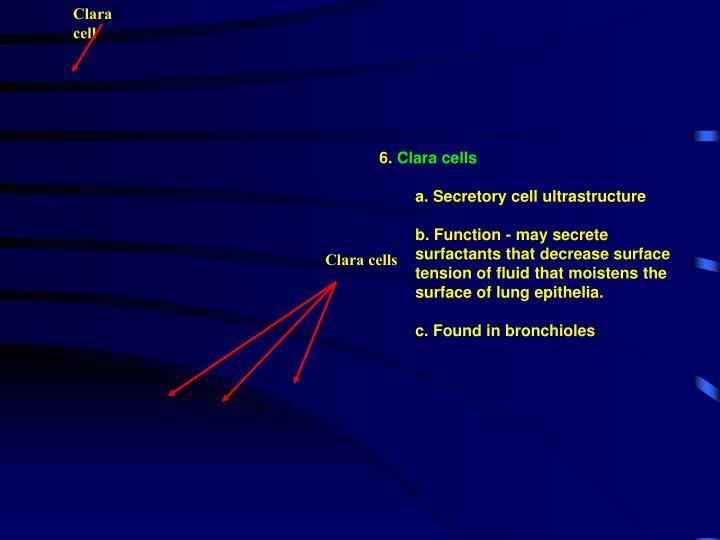 ** Clara cells are abundant in epithelium. A few ciliated cells. Nogoblet cells. 5. 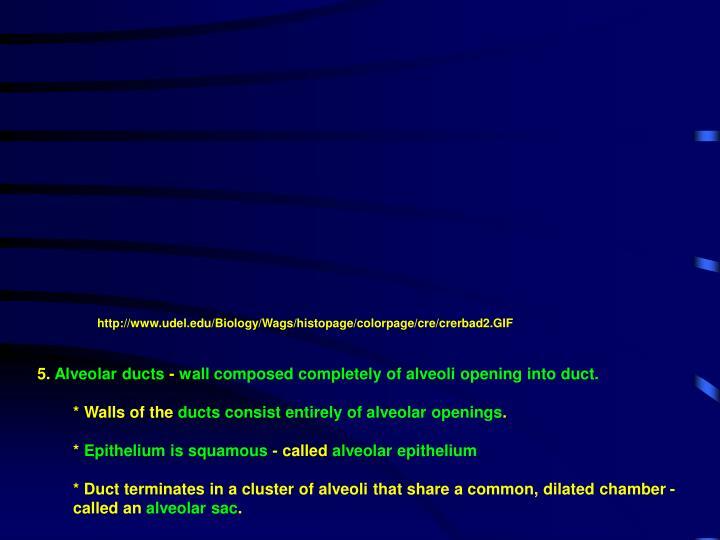 Alveolar ducts - wall composed completely of alveoli opening into duct. 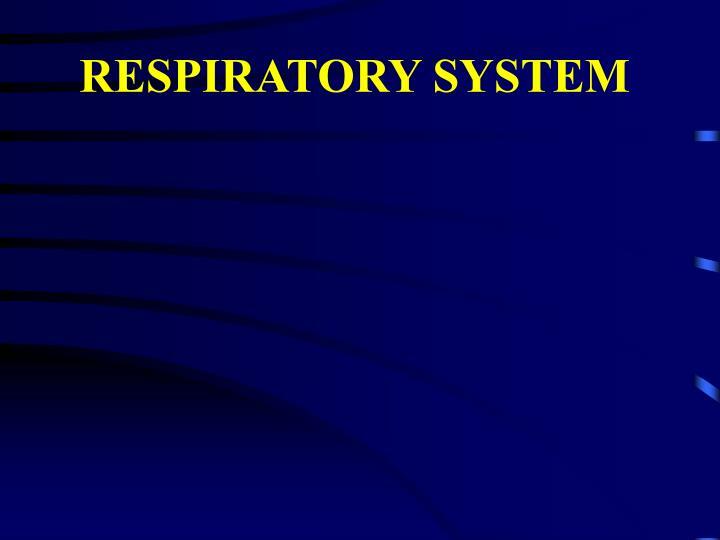 * Walls of the ducts consist entirely of alveolar openings. 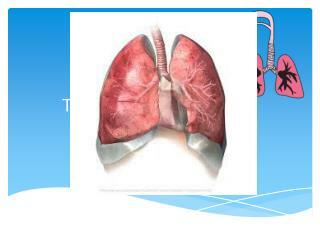 * Duct terminates in a cluster of alveoli that share a common, dilated chamber - called an alveolar sac. A. 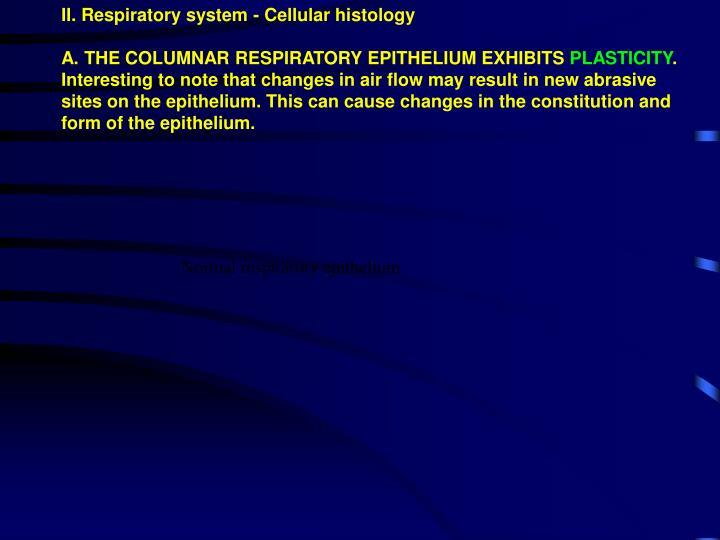 THE COLUMNAR RESPIRATORY EPITHELIUM EXHIBITS PLASTICITY. 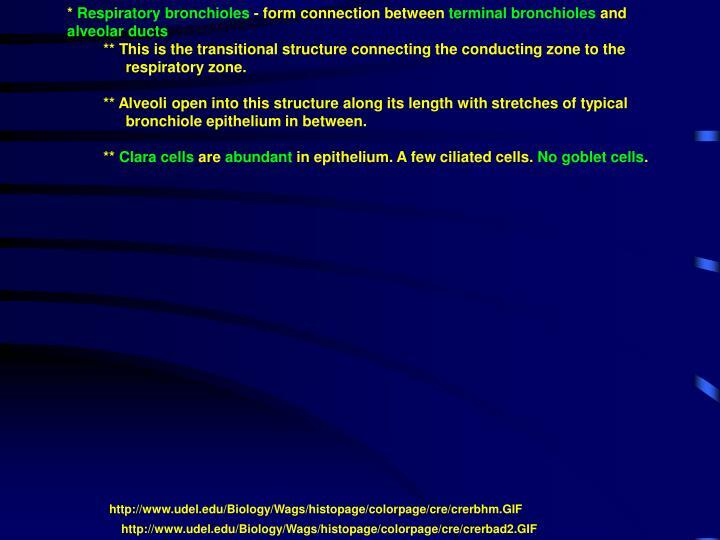 Interesting to note that changes in air flow may result in new abrasive sites on the epithelium. 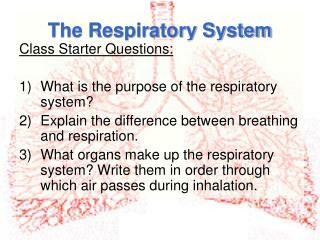 This can cause changes in the constitution and form of the epithelium. B. 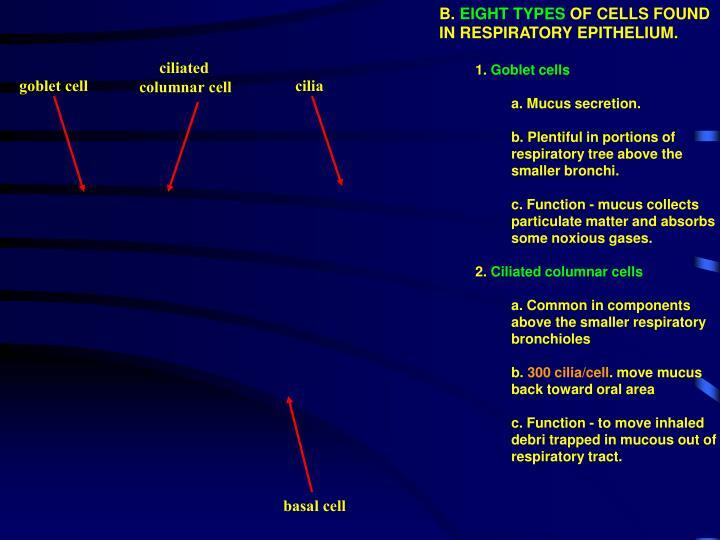 EIGHT TYPES OF CELLS FOUND IN RESPIRATORY EPITHELIUM. b. 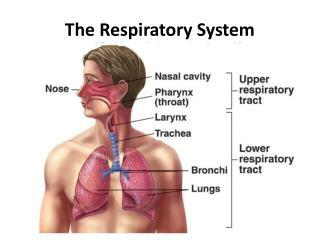 Plentiful in portions of respiratory tree above the smaller bronchi. 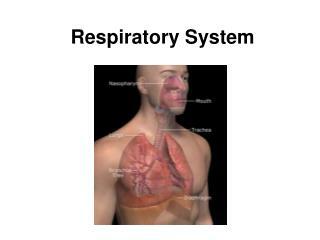 c. Function - mucus collects particulate matter and absorbs some noxious gases. 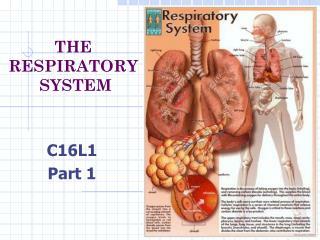 c. Function - to move inhaled debri trapped in mucous out of respiratory tract. c. Thought to have endocrine or sensory function. a. 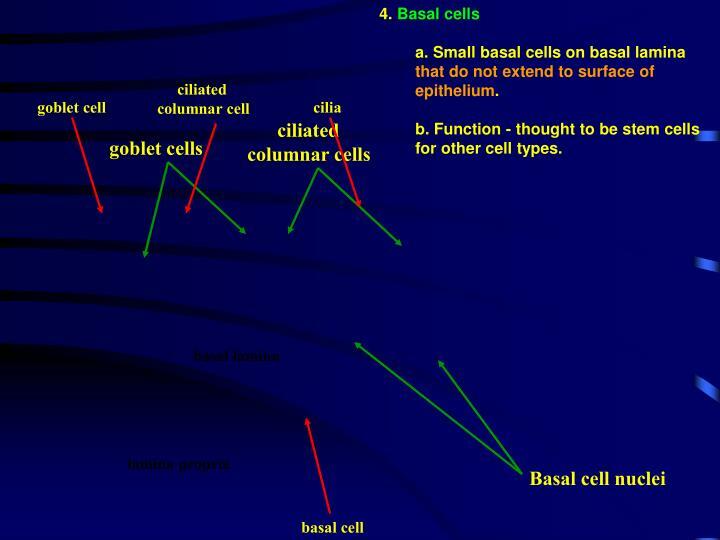 Small basal cells on basal lamina that do not extend to surface of epithelium. b. Function - thought to be stem cells for other cell types. a. Look like basal cell, but have granules in cytoplasm. b. 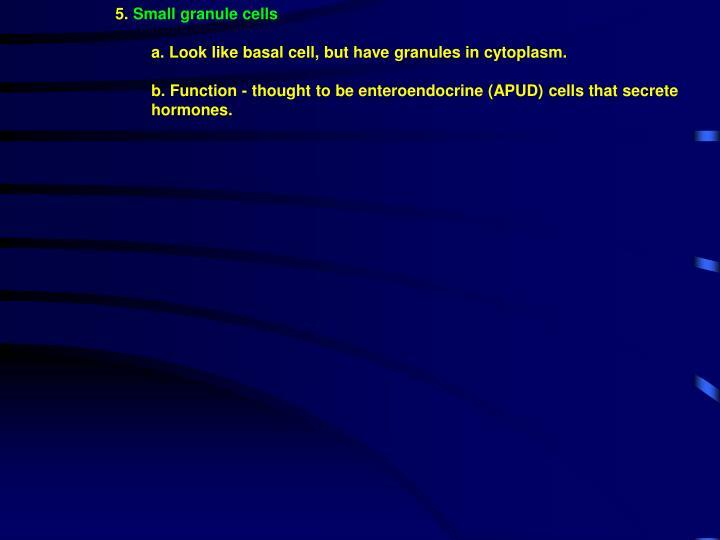 Function - thought to be enteroendocrine (APUD) cells that secrete hormones. b. 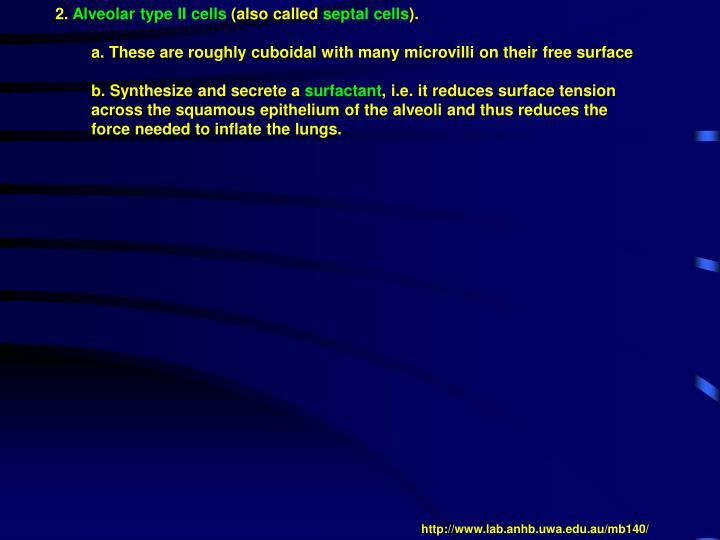 Function - may secrete surfactants that decrease surface tension of fluid that moistens the surface of lung epithelia. A. 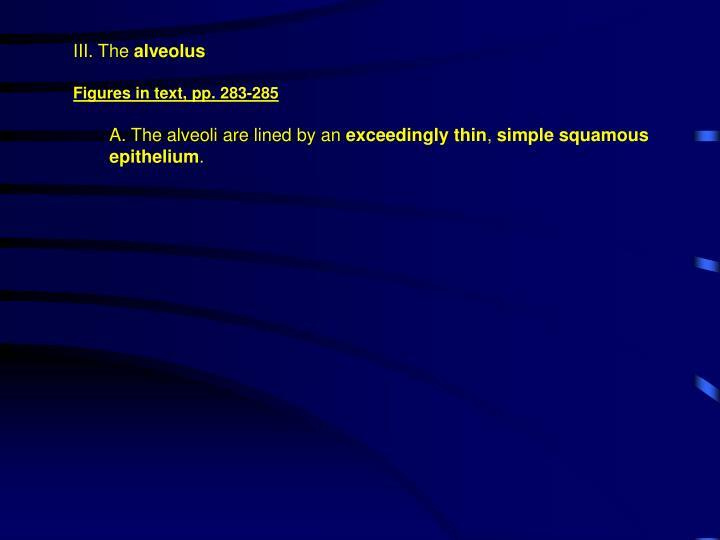 The alveoli are lined by an exceedingly thin, simple squamous epithelium. 1. The endothelium of the capillaries - continuous, non-fenestrated endothelium. 2. Basal laminas of epithelia of aveolar type I cells and capillary endothelial cells that are fused at some points. a. the cells across which gaseous transfer occurs, possibly at the sites of fusion between this cells basal lamina and that of the capillary endothelial cells. 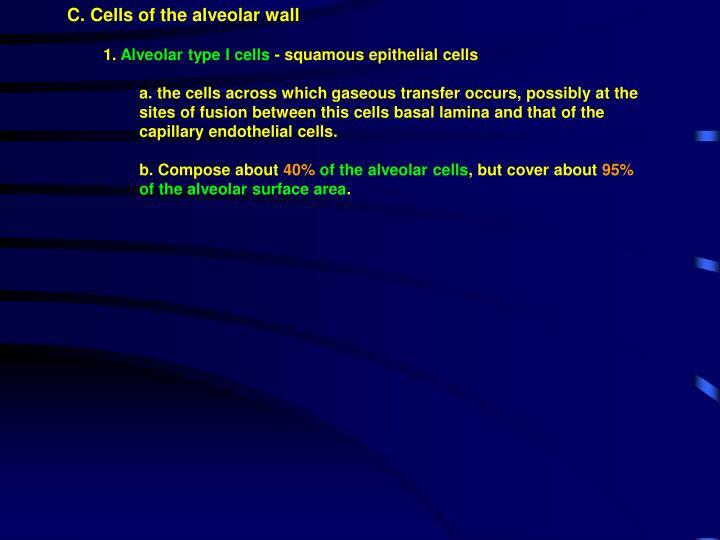 b. Compose about 40% of the alveolar cells, but cover about 95% of the alveolar surface area. 2. 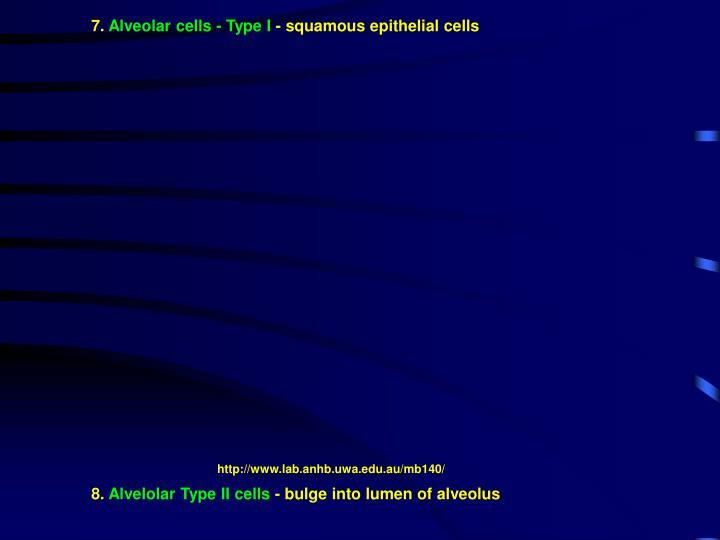 Alveolar type II cells (also called septal cells). 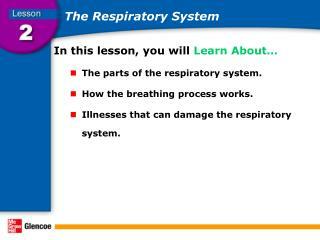 b. Synthesize and secrete a surfactant, i.e. 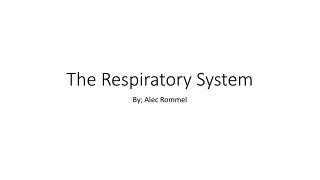 it reduces surface tension across the squamous epithelium of the alveoli and thus reduces the force needed to inflate the lungs. 3. 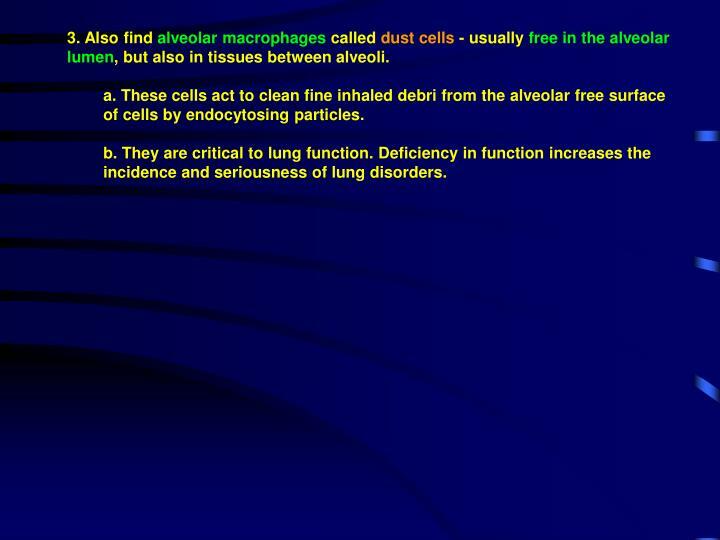 Also find alveolar macrophages called dust cells - usually free in the alveolar lumen, but also in tissues between alveoli. a. 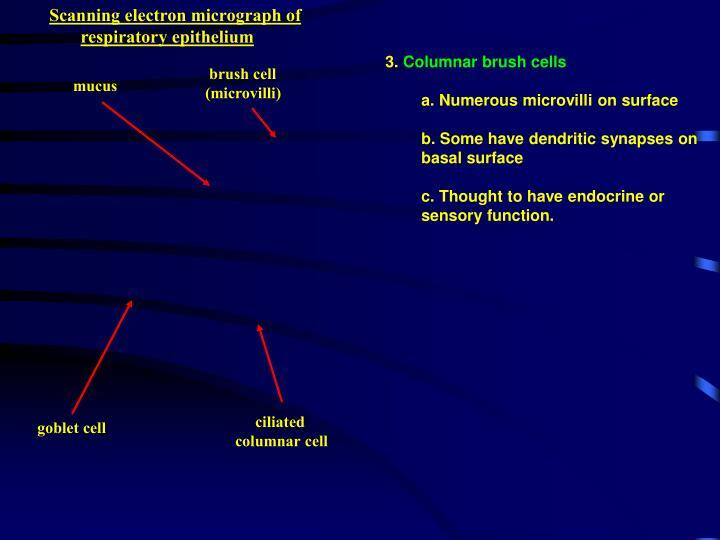 These cells act to clean fine inhaled debri from the alveolar free surface of cells by endocytosing particles. b. 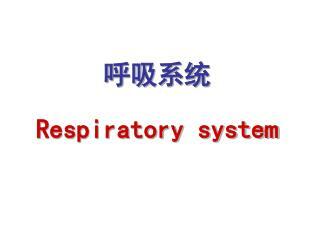 They are critical to lung function. 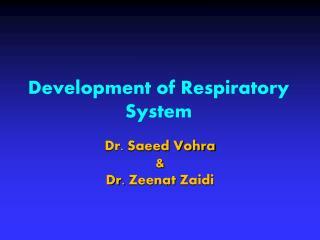 Deficiency in function increases the incidence and seriousness of lung disorders. 1. 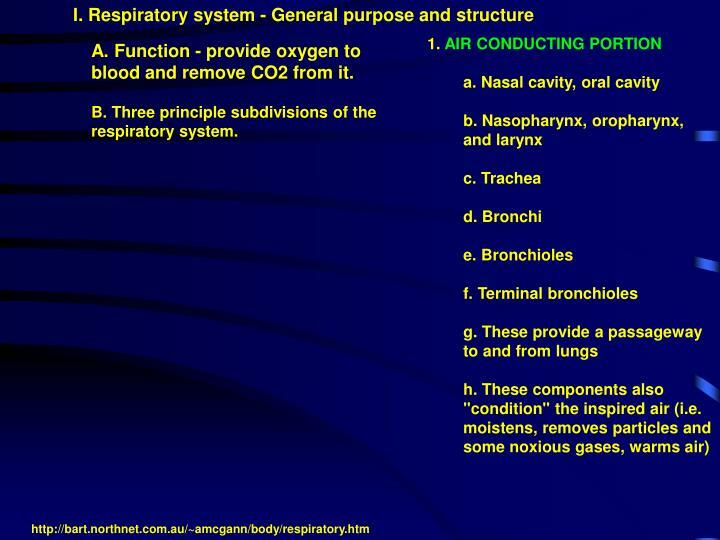 This refers to the substances/structures that lie between the air in the alveolar sacs and the blood in the capillaries. 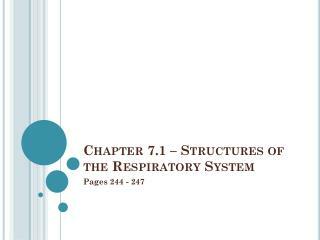 * In areas where basal lamina of the two endothelial layers are not fused, reticular and elastic fibers are present. b. 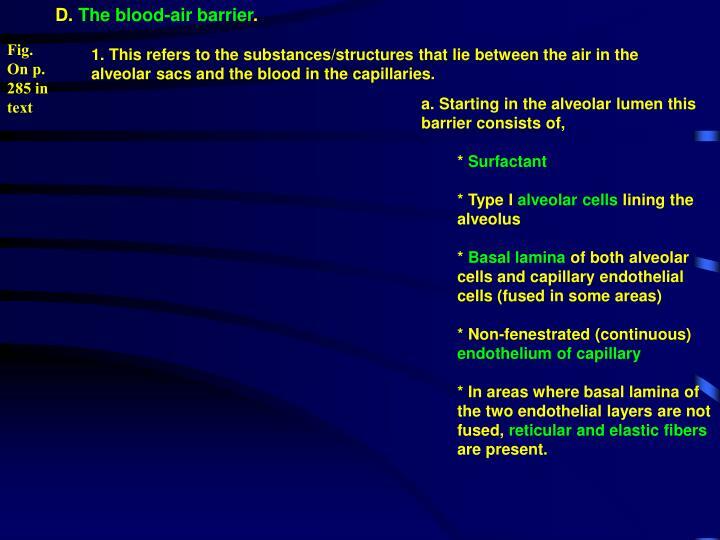 The blood-air barrier prevents air in gaseous form from mixing with the blood. 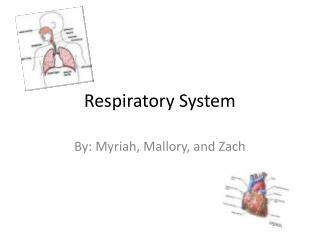 * Called an embolism (arterial or venous gas embolism). 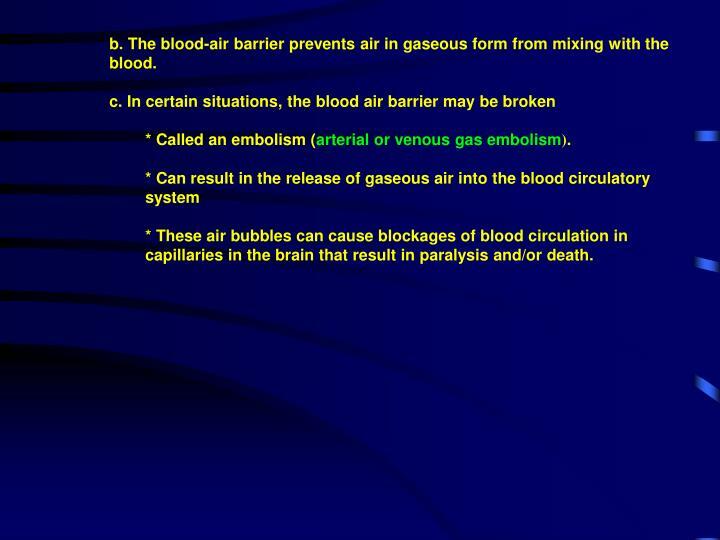 * These air bubbles can cause blockages of blood circulation in capillaries in the brain that result in paralysis and/or death.